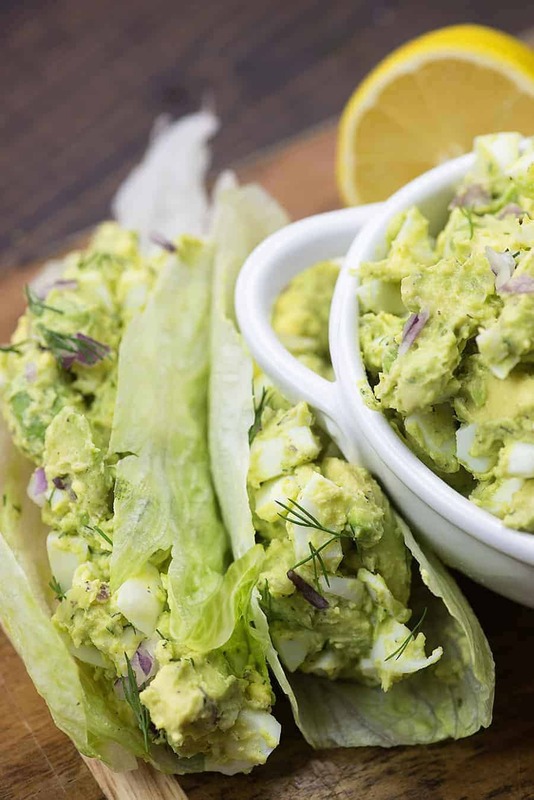 This keto egg salad is loaded with healthy fats and protein from the avocado and eggs. This is such an easy recipe and we love to serve it in lettuce wraps, but it’s good to eat with a fork too! I’ve always been a big fan of deviled eggs and my aunt makes some amazing ones. She brings them to just about every get-together we have and they always are one of the first things to go. Everyone loves deviled eggs, right? The thing is, my husband will down a bunch deviled eggs with no problems. He LOVES them. But put some egg salad in front of the man and he’s all, nope. Not interested. Y’all realize that egg salad is basically just mooshed up devilled eggs, right? Today, I’m sharing egg salad with avocado which is a bit different than a traditional egg salad or deviled egg. 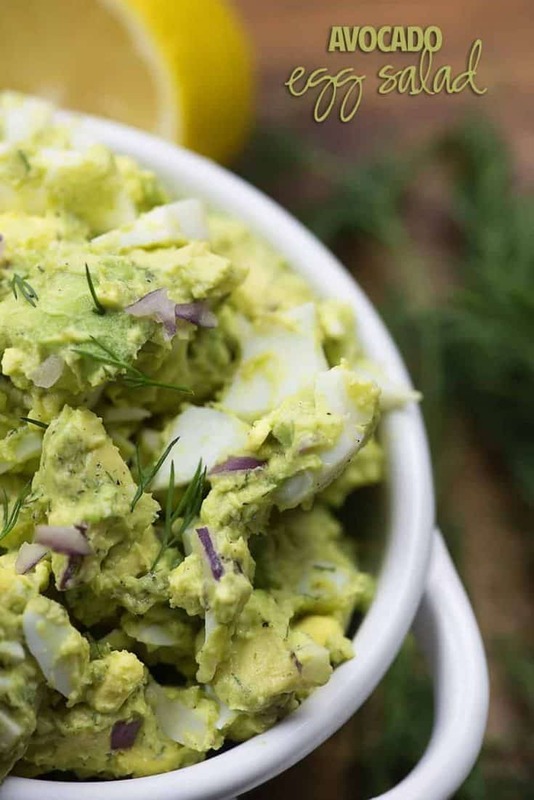 This keto egg salad is packed with avocados. They’re a “good” fat, right? I often eat an entire avocado for breakfast. All that fat is so filling that I’m not hungry again until lunch. Super filling and so nutritious, too! 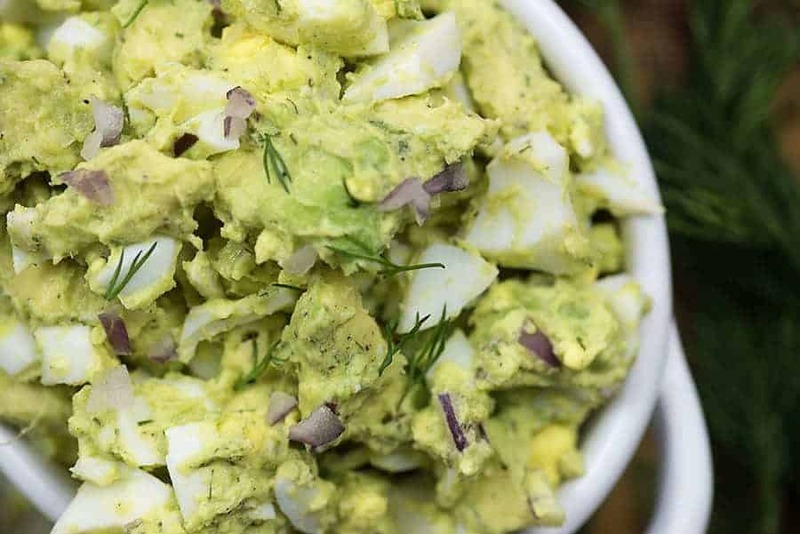 Avocado is total perfection if you’d like to make egg salad without mayo. As you stir together the diced eggs with the avocado, the avocado starts to break down and coat the eggs. It makes for a creamy egg salad without mayo and the flavors are so fab. 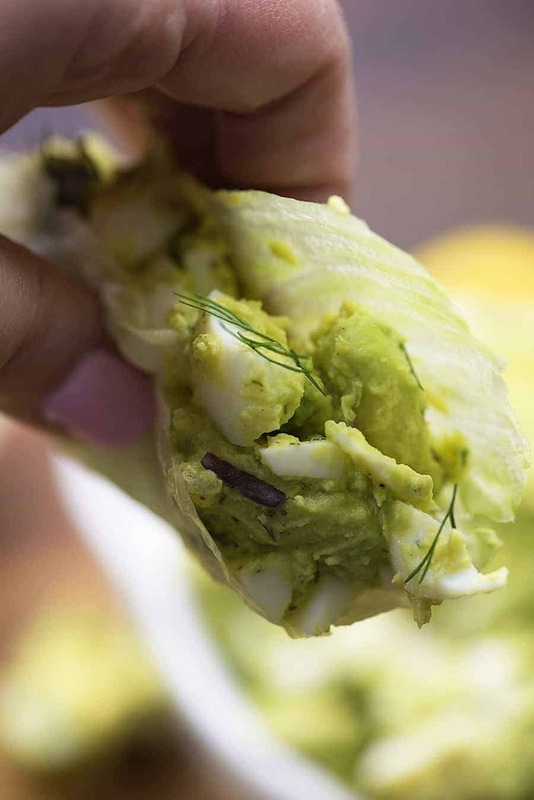 I made this egg salad with dill, because I just love the way fresh dill brightens things up. I also stirred in some red onion for crunch. This keto egg salad is easy to customize to suit your tastes! 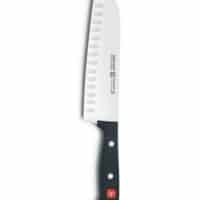 Stir in some chopped pickles or make your egg salad with relish. The tanginess of dill pickles works great in this dish. Add bacon for a little extra saltiness and protein. Bacon makes everything better, right? If you really want to amp the protein up, stir in some cooked shredded chicken. Now you’ve got an avocado chicken salad! You could go with a Mexican vibe really easily here by replacing the dill with cilantro and the lemon with lime. How fun is that? Here’s my secret trick – pressure cook your eggs! I know, I know. You probably don’t want to go out and purchase a pressure cooker or Instant Pot just for boiled eggs, but my Instant Pot gets put to use for many other things! We do eat a TON of boiled eggs though. They’re the perfect low carb snack! To boil eggs in an Instant Pot, place 1 cup of water in the liner and add in as many eggs as you like in a single layer. Pressure cook on high for 5 minutes. Let the pressure release naturally for 5 minutes and then do a quick release. Place the eggs in an ice bath for 5 more minutes to cool down and stop the cooking process. Perfectly cooked hard boiled eggs and they peel like a dream. The shells literally just slip right off the eggs. I also use the Instant Pot to cook a bunch of chicken breasts and then shred them up and keep bags on shredded chicken on hand for meals. I used some of my Instant Pot shredded chicken in these keto stuffed peppers. 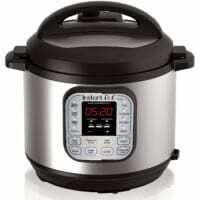 You can buy an Instant Pot here through my affiliate link. I hope you try this egg salad with avocado! It’s a favorite of mine and I think you’ll love it, too! Keto Deviled Eggs: There is bacon and cheddar involved, you guys! Deviled Egg Salad: Can’t go wrong here! Spicy Deviled Eggs: Basically a jalapeno popper in egg form. Check out my video for keto egg salad above! This healthy egg salad is made extra creamy from the addition of avocado. Such a tasty twist on the traditional egg salad. The nutrition information is for the egg salad only and doesn't include info on lettuce if you choose to make lettuce wraps with this. Peel and dice the boiled eggs and place in a medium mixing bowl. Add the avocado to the eggs and stir well. The avocado will become creamier the more you stir and coat the eggs. Squeeze the lemon half over the eggs and stir in the onion, dill, salt, and pepper. Stir well to combine the mixture. 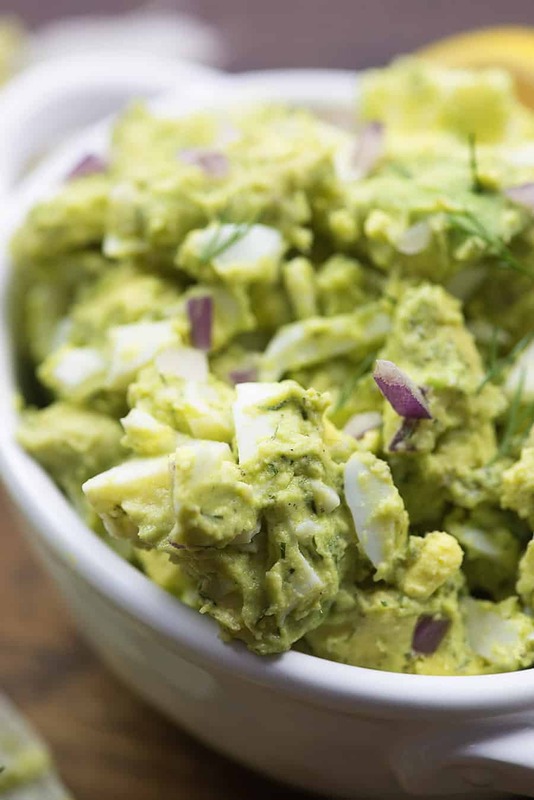 This avocado egg salad is best served immediately or within a few hours of making as the avocados will start to brown otherwise. 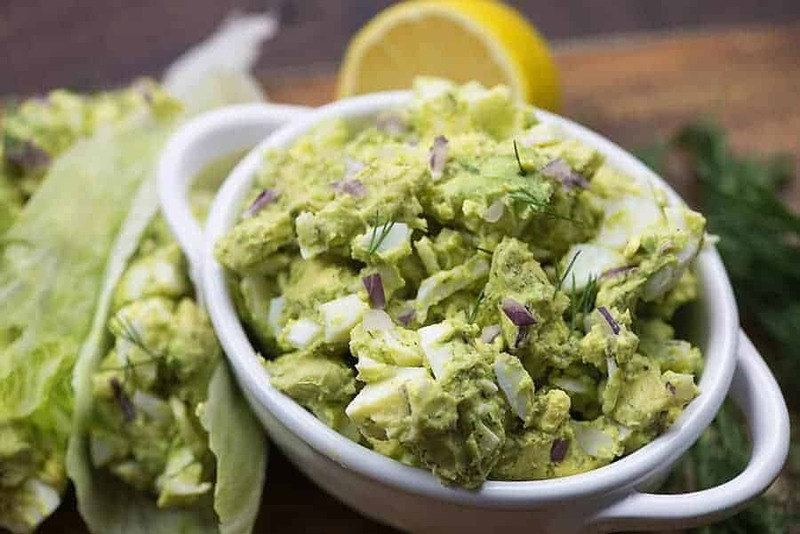 To keep the avocados from turning as long as possible, squeeze an extra bit of lemon juice over the top of the mixture and press plastic wrap directly onto the egg salad. Is there any way you can put the sodium content in the nutrition posted? Total yumminess going on here!! Love avocados and eggs. Gonna make this for lunch and then try a version with cilantro, lime, chipolte peppers and a little sour cream. Thanks for the recipe. Love your blog! I love this!! Sometimes I dip my egg salad with potato chips (hehe), I love the idea of using lettuce!! Thank you! Egg salad makes a great chip dip! Haha! 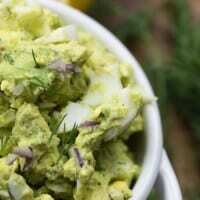 Your avocado egg salad is one of my favorite recipes now but I wonder how much protein the recipe equals? 1/6th of the total recipe is what the nutrition info is calculated on. It will start to turn brown the longer it’s exposed to oxygen. Keep it tightly covered and make sure plastic wrap is touching the surface when you seal it. It still probably won’t last more than a day or so unless you don’t mind it oxidizing. Of you keep the avocado seed in the salad, it will help prevent it from turning brown. OMG. Eggs in the pressure cooker – who would have thought. They peeled like a dream. Thanks for the tip. The salad was yummy. Thanks.